The Tobacco Free Living Action Team of the Healthy St. Mary’s Partnership has invited Bishop Larry Lee Thomas, the founder of Smoke Free Holy Grounds, to speak at an open information session for interested organizations on Friday, March 29, 2019, from 1 to 2 pm in Meeting Room A/B at the Lexington Park Library at 21677 Franklin Delano Roosevelt Blvd. in Lexington Park, Md. MedStar St. Mary’s supports the Healthy St. Mary’s Partnership. The Tobacco Free Living team of the Healthy St. Mary’s Partnership is active in the community, working to improve health outcomes by reducing tobacco use and exposure to secondhand smoke. Both of those factors contribute substantially to the leading causes of death in St. Mary’s County: cancer, heart disease, stroke, Chronic Obstructive Pulmonary Disease, and diabetes. Faith-based organizations play a critical role in strengthening the connections of neighborhoods and communities. They mobilize residents to address community issues by promoting volunteerism and delivering direct services across a wide spectrum to work on critical human needs that have not been met elsewhere. 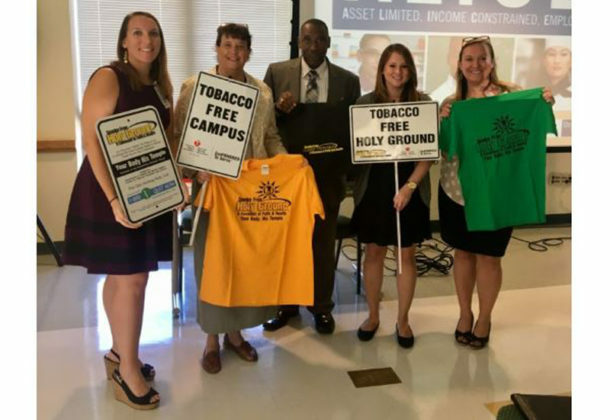 Faith-based organizations are able to reach a large number of residents on a consistent basis and the Tobacco Free Living team hopes to partner with these organizations to provide the tools and expertise that are needed to promote health and wellness for their congregations. Smoke Free Holy Grounds is an initiative that has been implemented through pastoral leadership to promote and practice healthy lifestyles in the faith community. It includes a covenant to adopt tobacco-free policies on sites and to implement tobacco prevention and cessation programs for members, with the help of public health partners like the TFL team. By joining this initiative, local congregations can join more than 300 other churches across the state that are dedicated to healthy and positive environments. While St. Mary’s County has one of the highest smoking rates in Maryland, the county has one of the lowest participation rates in the Smoke Free Holy Grounds initiative. Great changes can be made on both ends with the help of local churches. For more information, contact the St. Mary’s County Health Department at 301-475-4330.